One of the great things about our edible printer is that we can easily match our cake balls and cake pops to the theme of any party! 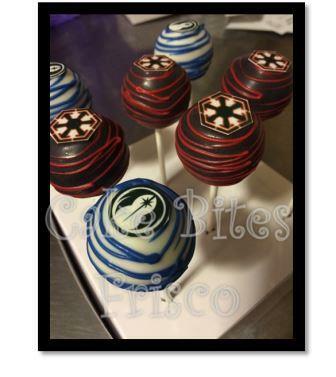 Check out these cool Star Wars themed cake pops we made for a little boy's birthday party. The options are limitless - if you have an image we can put it on a cake ball or cake pop! This is ideal way to add adorable decorations to your party or celebration, spread the word about your company with an edible logo, or say thank you to your guests with personalized wedding favors. Order online at http://www.cakebites.biz/design-your-own/logo-cake-bites/.